Everything seems to be going Laura's way in her acting career. She has a couple of big movies under her belt and is in demand for even more prestigious projects. On the other hand, Jake's writing career is in danger. 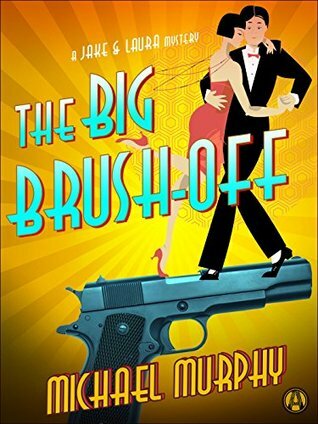 Despite several best-sellers his editor, Mildred, feels that Jake has lost touch with his gumshoe hero, Blackie Doyle. She has rejected his rough draft of the first few chapters of a new book and demanded a re-write. He has one chance to prove himself or lose his contract with Empire Publishing. Jake thinks that returning to his roots as a Pinkerton Detective may give him the boost that he needs. One case has always been at the back of his mind; that of teenage Katie Caldwell. Katie was murdered in her own bedroom ten years earlier. Jake had worked on the case then but was called away when his father suffered a stroke. Now Katie's mother is asking him to take another look.There were plenty of suspects at the time, most of whom are still around in the small town of Hanover, PA. Jake and Laura hop a train to Hanover, but surprisingly, no one is very interested in solving the case and some are actively opposed. Anyone with a weakness for the screwball comedies and crime films of the 1930's (like me) should enjoy the Jake and Laura Mysteries. The couple is very well off in an era when most Americans are not, but neither has forgotten their hard-scrabble beginnings. They are well aware of how lucky they have both been. The Big Brush-Off is well grounded with lots of period detail and two likable protagonists, and a mystery with plenty of twists and turns. I highly recommend the series for fans of historical mysteries and those who enjoy "Nick and Nora Charles" type banter. Thanks for reading and reviewing in your terrific blog!